School leaders are overwhelmed by the broad number of challenges and the complexity of their work. As a result, Los Angeles schools have not had a chance to fully integrate and implement reforms intended to boost student outcomes. Teachers are yearning to be engaged with leadership opportunities at the school site level to support the overall success of their students. However, there are limited pathways to address three critical areas that may fall short: socio-emotional support, instructional support, and family engagement. The three foundational needs of Los Angeles students are to 1) feel safe and welcomed on campus; 2) feel challenged and supported in the classroom; and 3) receive support and resources at home. These are the areas that school leaders can prioritize to truly close the gaps in academic and social well-being. School leaders should work together with teachers in a distributed leadership model to make the changes that will allow students to thrive. Invest in restorative justice and socio-emotional learning practices in order for our students to feel safe and welcomed on campus. 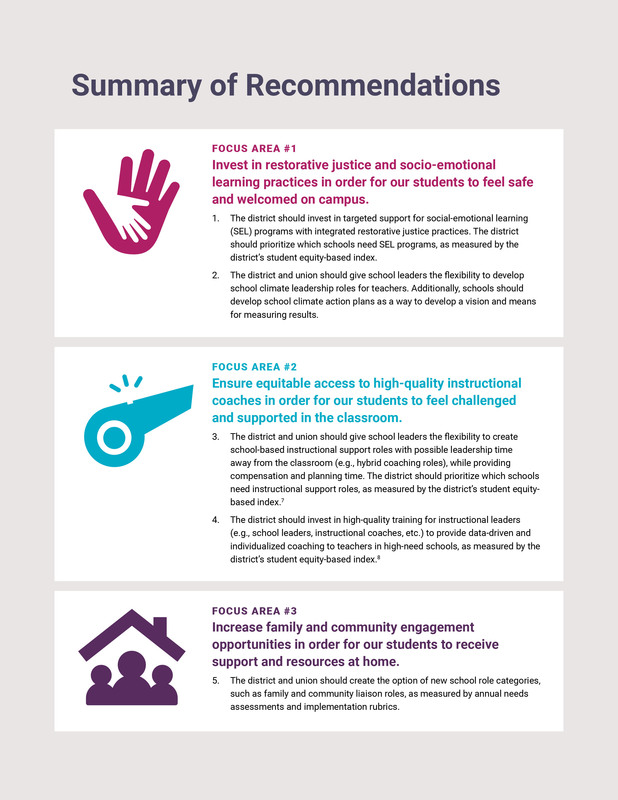 The district should invest in targeted support for social-emotional learning (SEL) programs with integrated restorative justice practices. The district should prioritize which schools need SEL programs, as measured by the district’s student equity-based index. The district and union should give school leaders the flexibility to develop school climate leadership roles for teachers. Additionally, schools should develop school climate action plans as a way to develop a vision and means for measuring results. Ensure equitable access to high-quality instructional coaches in order for our students to feel challenged and supported in the classroom. The district and union should give school leaders the flexibility to create school-based instructional support roles with possible leadership time away from the classroom (e.g., hybrid coaching roles), while providing compensation and planning time. The district should prioritize which schools need instructional support roles, as measured by the district’s student equity-based index. The district should invest in high-quality training for instructional leaders (e.g., school leaders, instructional coaches, etc.) to provide data-driven and individualized coaching to teachers in high-need schools, as measured by the district’s student equity-based index. Increase family and community engagement opportunities in order for our students to receive support and resources at home. The district and union should create the option of new school role categories, such as family and community liaison roles, as measured by annual needs assessments and implementation rubrics. We are a team of 17 teachers who met over the course of six weeks to review research on different national attempts to improving school leadership practices, as well as local strategies being proposed or piloted by LA Unified, Partnership for Los Angeles Schools, and The Center for Powerful Public Schools. Additionally, we hosted conversations with leaders from the Partnership for Los Angeles Schools, The Center for Powerful Public Schools, UCLA Center X, and other local and national experts. We conducted over 150 peer and administrator interviews and interviewed dozens of students and families to gather critical stakeholder feedback.